Whenever Son visits his parents, his mom sends a bunch of food and fruit back with him. Recently, she sent a bag of jackfruit. I had never tried jackfruit before, so Son made me try some. It’s pretty good! It tastes similar to mango (I think), but not quite as sweet. Anyways, I had recently seen a recipe using jackfruit and banana (although in a cupcake) while perusing through a delicious looking cupcake blog (makes me want to bake more often!). So I figured jackfruit and banana make a pretty good combination, and I added imitation crab in because I wanted to add some meat into the sushi too. 🙂 Try it… it’s a pretty good combination. We were on the front page search results for “sushi” today! For about an hour. Hehe oh well… it was pretty cool while it lasted and we are still pretty close! My goal is #1. Haha yeah, not gonna happen anytime soon, but I can dream right? Also, we are working on the shirts! I promise! Neither Son nor I are graphic artists, so it is taking us a while to get a design… and we can’t afford to pay a professional for it. I asked my brother to do it (he’s 14, so you know he wants the money), but my daredevil brother promptly broke his collarbone and separated his shoulder… so a design isn’t coming from him. 😛 But don’t despair! The shirts are coming… eventually! Drain the can of jackfruit. Slice the bananas in half, lengthwise. 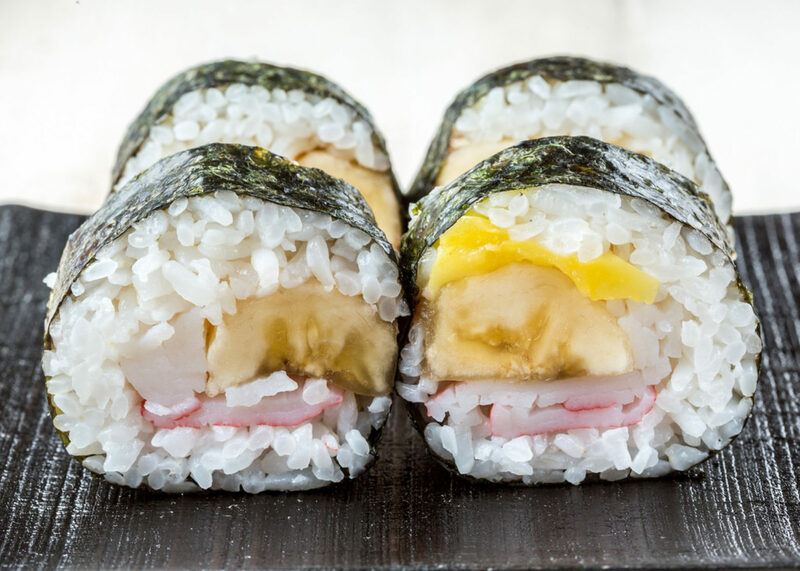 Roll the sushi, using jackfruit, half a banana, and imitation crab as your fillings. This was a really good roll. I had no jackfruit so I used mango instead- and I tried it with red bananas. Yum! Thanks for sharing so many great sushi ideas!